Need a new idea for Sunday dinner? 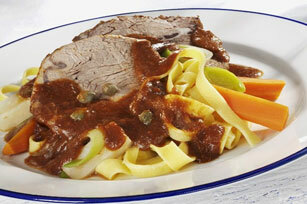 How about our Beef Roast with Carrot-Leek Pasta? Add the veggies to the cooking pasta to shorten your prep time. Heat oil in ovenproof Dutch oven or large deep skillet on medium-high heat. Add roast; cook 4 min. on each side or until evenly browned on both sides. Mix broth, dressing and 1 Tbsp. capers. Pour over roast; cover. Bake 2 to 2-1/2 hours or until roast is done (160°F). Remove from oven. Ladle meat drippings into small saucepan. Let roast stand, covered, until ready to slice to serve. Cook pasta in large saucepan as directed on package, omitting salt and adding carrots to the boiling water for the last 6 min. and leeks for the last minute. Meanwhile, bring meat drippings to boil. Mix corn starch and water; whisk into meat drippings. Cook and stir 2 min. or until slightly thickened. Stir in remaining capers. Slice roast. Serve with pasta and sauce.